Actions enable users to do more in Salesforce, such as create or update records and log calls. If you’ve already created and used actions in your organization, you’re familiar with how they work in Salesforce Classic. If you’ve used our mobile apps, you’ve seen how they work in the Salesforce mobile app. 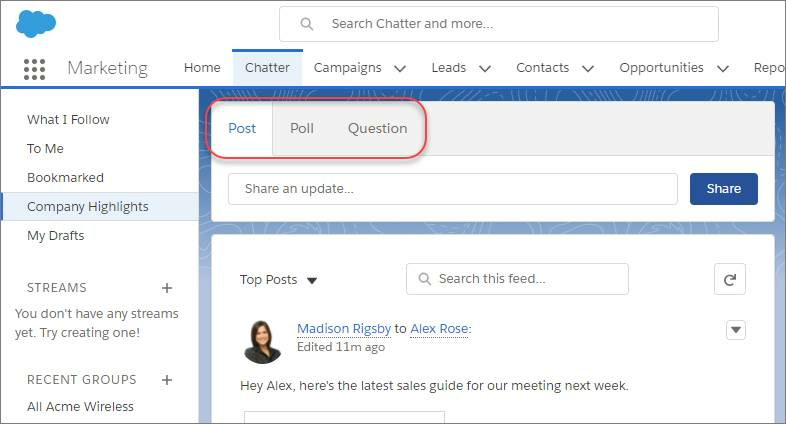 In Lightning Experience, instead of showing up in one place—like the Chatter publisher or the Salesforce mobile app action bar—actions are split into different areas. Next, we go over where you can find actions, which actions are and aren’t supported, and how the customizations you’ve made to actions on a page layout affect how they display in Lightning Experience. If you’re not familiar with actions, take some time to review these action units, which are part of the Salesforce Mobile Basics Trailhead module. They’re couched in the context of the Salesforce mobile app, but can give you an overview of what actions are and how they work. In Lightning Experience, actions display in the Global Actions menu in the header, on related lists, and on list view items. Actions also appear in several places on a record page. Where actions appear on a record page depends on the action’s type. Quick actions aren’t the only action type covered here. Standard and custom buttons are also considered actions. 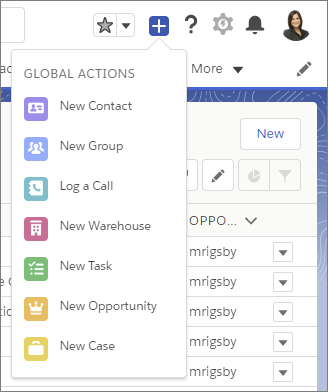 The Global Actions menu displays a subset of global actions from the Salesforce Mobile and Lightning Experience Actions section of the global publisher layout. The items in the menu appear in the order that they’re listed in the Salesforce Mobile and Lightning Experience Actions section of the global publisher layout. Actions associated with objects that aren’t supported in Lightning Experience don’t appear in the Global Actions menu. Also, the Global Actions menu doesn’t support standard Chatter actions. Custom buttons, list view actions, and certain standard buttons are supported on all list views, except Recently Viewed. To have a custom button appear on a list view, add the button to the object’s List View search layout. In the Kanban view, only the standard New action is supported. List view items support only specific standard actions, like Edit, Delete, or Change Owner. For Tasks, table format list views and the Kanban view support only standard buttons. Tasks list view items in table view and the task item detail pane in split view contain the complete list of available actions for tasks. On the Home page, you can find actions on recommendations in the Assistant. For example, imagine that a sales rep receives an update that an opportunity doesn’t have any open activity. The rep can create a task or event directly from the recommendation. After you complete an action, the related recommendation disappears from the Assistant. The Chatter page, like the Chatter tab on record pages, contains only standard Chatter actions. 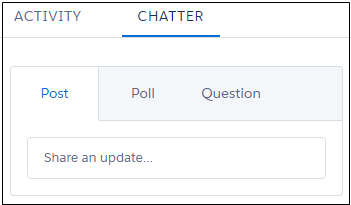 By default, only the Post, Poll, and Question actions are supported, and if you have Groups, the Announcement action. 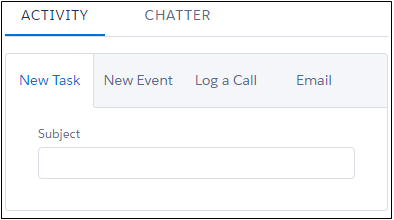 You can add, remove, or reorder the actions on the Chatter page from the Salesforce Mobile and Lightning Experience Actions section of the global publisher layout. Here’s a sample contact page in Lightning Experience. The opportunity and leads workspaces have different structures, but actions appear in the same way on those pages. The actions that appear in the page-level action menu are listed in the order that they appear in the Salesforce Mobile and Lightning Experience Actions section of the page layout. The Activity tab (2) contains Create a Record quick actions that point to the Event and Task objects. It also contains Log A Call and Send Email actions. The Chatter tab (3) contains standard Chatter actions. By default, only the Post, Poll, and Question actions are supported, and if you have Groups, the Announcement action. Some objects support other standard Chatter actions predefined by Salesforce. Related lists in Lightning Experience (4) show custom list buttons and supported standard buttons assigned to the related list. Not all related list standard buttons are supported in Lightning Experience. Actions on reports come from the Quick Actions in the Salesforce Classic Publisher section of the global publisher layout. However, only standard Chatter actions appear on reports, regardless of which other actions are assigned to the global publisher layout. Let’s say you have these actions on your Contact page layout in the Salesforce Mobile and Lightning Experience Actions section. You have quick actions (New Account, New Event, New Task), a productivity action (Call), standard buttons (Edit, Delete, Clone, Send an Email), and Chatter actions (Poll, Post). Here’s how those actions appear on a contact record page in Lightning Experience. The actions in the page-level action menu are a combination of the quick actions, productivity actions, and standard buttons. These actions appear in the order that they’re listed on the page layout. Although they’re quick actions, New Event and New Task don’t show up here. The Chatter actions from the front of the action list are on the Chatter tab. The Activities-related actions—Email, New Event, New Task—display on the Activity tab. In Lightning Experience, the actions on record pages are derived from the list of actions in the Salesforce Mobile and Lightning Experience Actions section of the page layout for that object. The same section on global publisher layouts determines the global actions that appear in the Global Actions menu. When you click to override the predefined actions in the Salesforce Mobile and Lightning Experience Actions section, the custom buttons in the buttons section of the page layout aren’t automatically included in the action list. You must add the custom buttons as actions from the Mobile & Lightning Actions category in the palette. The actions in each section of the record page respect the ordering of its types of actions on the page layout. The Global Actions menu ( ) in the Lightning Experience header displays all global quick actions from the Salesforce Mobile and Lightning Experience Actions section of the global publisher layout, except the standard Chatter actions Post, File, Poll, Link, Question, and Thanks.